I mentioned in a previous article that Michel Platini’s performances in the 1984 European Championship were comparable to those of Maradona in Mexico 86. Not everyone agreed it turns out, but I stand by the claim. The European Championships of 1984 were completed dominated by the mercurial midfielder, with Platini scoring 9 goals in just 5 games – a haul that’s still enough for him to be the all time leading scorer in that tournament. And it wasn’t as if he did it against poor teams (See Oleg Salenko’s 5 goals in USA 94). Platini scored in every match – including a winner in the 119th minute against Portugal in the Semi Final, and then the opening goal against Spain in the Final. 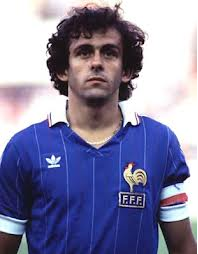 Part of the magic square midfield for France along with Tigana, Fernandes and Giresse, Platini was the standout performer. From the 1982 World Cup semi final against West Germany, Platini scored in every international knock out game until the 1986 World Cup semi final – or to put it another way, six consecutive games – one of the greatest big game players of all time. To back this up, he was also pretty handy for his club sides, excelling in particular with Juventus. The successor to Liam Brady at the heart of the Juve midfield, he scored in the 1983 European Cup semi final against Lodz, before repeating the trick in 1985 against Bordeaux. In the final, sadly overshadowed by tragedy, he scored the only goal from the penalty spot to win the trophy for Juventus and the golden boot for himself. For the record, Maradona was ranked in joint 65th place on this list. win over Portugal, as Alf Ramsey’s men lifted the only trophy in England’s history. When you see Paolo Rossi’s name then there’s a good chance you’d assume the hat trick against Brazil in the 1982 World Cup was the driver behind his lofty position. Well it’s not. It was undoubtedly a big game, and the redemption angle certainly built it up, but as this is the very biggest games (semis and finals), then it doesn’t qualify. Instead, Rossi has a bigger portfolio than suspected. 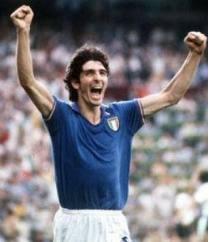 In the 1978 World Cup, Rossi scored in the final group stage match against Austria, he then had an enforced absence for two years before claiming the golden boot in 1982 with 6 goals, all in the knock out stages. After the Brazil hat trick, he hit a double against Poland in the semi final, before scoring the all important opener against West Germany in the Final. In club football, he scored in the semi final aggregate win against Lodz in the 1983 European cup before defeat to Hamburg. A prolific striker, Karl-Heinz Rummenigge enjoyed great career success with Bayern Munich, Inter Milan and West Germany. But it could have been even better. He won the European Cup in 1975 and 1976 with Bayern, but didn’t score in any of the semi finals or either of the finals. He did however score goals in the unsuccessful campaigns of 1981 and 1982 at the semi final stage against firstly Liverpool as Bayern went out on away goals, and then a brace to knock out CSKA Sofia a year later, only to lose to Aston Villa in the final. For his country he played in the three World Cups in between Germany’s wins in 1974 and 1990 – including two Final defeats in 1982 to Italy and 1986 to Argentina. In his first World Cup (1978), he scored the first three of his total nine World Cup goals, with the last of them in the final stage defeat to Austria. Four years later, he scored five goals as West Germany went all the way to final. His most notable goal was in the 3-3 Semi Final against France, with Rummenigge also scoring his penalty. In the 1986 World Cup, he scored in the Final against Maradona’s Argentina, but it wasn’t to be enough as Burruchaga scored the winning goal in the 83rd minute. As a consolation, he does at least have a European Championships medal from 1980. There’s been millions of words written about the football genius that was Johan Cruyff, and there’s not much I can add that hasn’t been said on his ability. But what of his goal scoring in the big games? Well despite not being an out and out striker, the Dutch legend had a very impressive strike rate of a goal every 1.7 games for his clubs, and an even better 33 goals in 48 caps for Holland. And amongst those goals, were six scored in the latter stages of the biggest tournaments. First up was the 1969 European Cup semi final, when he scored the opener in a 3-2 aggregate win over Czechoslovakian Champions Spartak Trnava, before losing to AC Milan in the Final. He and his Ajax team mates wouldn’t have to wait too long for that first title though, following on Feyenoord’s lead, they lifted the trophy in 1971, 1972 and 1973 and it was the second of that hat trick of wins that saw Cruyff really hit the big time. In what’s been described as Total Football’s greatest moment, Ajax defeated Italian giants Inter Milan 2-0 in the final with Cruyff scoring both the goals – one an open goal, the second a towering header at the back post, not quite the beautiful goals you’d expect, but very important nonetheless. For his country, he had a massive impact on the 1974 World Cup, scoring three goals in the Final Group stage, propelling Holland to the Final. His double against Argentina was followed up with the second against Brazil in what was essentially a semi final. Sadly for football lovers, he didn’t play in the 1978 tournament, but he still left his mark on the biggest stages. Ready for another current player? Step forward Diego Forlan. Almost unrecognisable from the young forward that spent three seasons with Manchester United, Forlan who is currently playing in Brazil with Internacional, has been one of the best front men in World Football for the last five years, and has the goals to back this up. Having scored in both semi final legs against Liverpool, the first of these big game goals was in the 32nd minutedof the 2010 Europa League Final against Roy Hodgson’s Fulham. The second was in the same match, and an extra time winner to give Atletico Madrid the trophy. Later on that summer, Forlan scored five goals in the World Cup, with the biggest being the equaliser in the semi final against Holland. Sadly for him and his countrymen, Holland went on to win the game, though Forlan’s goal in the quarter final also pointed to a big game temperement. Fast forward 12 months and he was the star of the 2011 Copa America as Uruguay won their 15th South American title, but more importantly, their first since 1995. Forlan combined with Luis Suarez to form a devastating partnership that scored all the goals in the Semi Final and Final of the tournament, as Forlan scored a brace against Paraguay to win the silverware for his country. We’ve already seen Rummenigge in the list, and just 3 places later is the other player who made up the FC Breitnigge partnership, Paul Breitner. It’s not the catchiest moniker, but it does illustrate the importance of the partnership that the pair struck up for both Bayern Munich and Germany. The interesting thing about Breitner’s inclusion this high up the list is that he played mainly as a left back (albeit cavalier) before moving into midfield. His first major impact on the big game scoresheet was in the 1974 World Cup where the 23 year old left back scored in the Final Group stage game against Yugoslavia in a 2-0 win. He then went on to score in the Final with just the second penalty ever awarded in a World Cup Final – 23 minutes after the first as West Germany went on to win the tournament. Fast forward to 1982 with Breitner back at Bayern after spells with Real Madrid and Eintracht Braunschweig and he was back amoung the big game goals. The 1982 European Cup saw Breitner as a midfield captain and he led by example in the semi finals, scoring three goals across the two legs against CSKA Sofia (he and Rummenigge scoring all four goals in the home leg). He’d feel the heartache of a final defeat in both that tournament and the World Cup that summer, as West Germany lost in the Final to Paolo Rossi’s Italy – though Breitner did become only the third player to score in two World Cup finals, behind Vava and Pele (only Zidane has managed it since). No big game scorers list would be complete without West Germany’s Muller. And this is no different, except that this isn’t the Muller that everyone knows. No, this is Dieter Muller rather than Gerd (no relation). And you have to feel a bit sorry for him as he’s something of a nearly man. Although he had a prolific career, he was always in the shadow of his namesake despite being the top scorer in Germany for both the 1976-77 and 1977-78 seasons. He also had the record for most goals in a Bundesliga match, scoring six goals in Cologne’s 7-2 win over Werder Bremen – only there were no cameramen to record it due to a strike. He only won 12 caps for West Germany (scoring 9 times), but he certainly made the most of his time with national team. His greatest moments in football came in the 1976 European Championships. With Gerd Muller now retired from the national team, Dieter had his chance to shine, and shine he did winning the golden boot. He scored a hat trick in the Semi Final against Yugoslavia with the latter two strikes coming in extra time to win it the game 4-2. And on the biggest stage of his career, he scored his country’s first goal as they drew 2-2 with the Dutch conquering Czechoslovakia team. Sadly for Muller though, the tournament is known for Panenka’s penalty. Two years later in the 1978 World Cup, Mulller scored two more goals, one in the final group stage in a 2-2 draw against finalists Holland. The fact that six of his nine international goals were in major tournaments suggests he wasn’t troubled by nerves. For his clubs, despite never playing for any of Europe’s giants, he scored in the 1979 European Cup semi final defeat to Brian Clough’s Nottingham Forest for Cologne, and then repeated his goalscoring semi final heartbreak in 1985, for Bordeaux against Juventus. Both occasions saw his team miss out on reaching the final by one goal. A prolific but very unlucky scorer. According to the South American football expert Tim Vickery, Ademir (full name Ademir Marques de Menezes) was one of Brazil’s greatest ever strikers and looking at his performances in the 1950 World Cup, it’s easy to see why. Ademir scored nine goals in just six games, as the hosts bulldozed everyone before them, except in the Final game against Uruguay. Perhaps this is why Ademir’s name isn’t as well known as it should be. At the height of his powers aged 28, six of his nine World Cup goals came in the final group stages. Firstly, he scored a massive four goals in the 7-1 win against Sweden before following it up with a brace in a 6-1 win over Spain. He won the golden boot but had to settle for a runners up medal as Uruguay produced a massive upset. Having made his professional debut in 1939, you have to wonder what he could have acheived on the World stage had World War II not halted the 1942 and 1946 editions, where Ademir would have been 20 and 24 respectively. In total, he scored a very decent 32 goals in 39 appearances for his country, including a hat trick in a play off final versus Paraguay in 1949 to win an early Souh American championship (before the Copa America was officially set up in 1975). Injury robbed him of at least five more years at the top, and the rest of us a chance to see a great player end his career properly, but he certainly made the most of his short time.